These are games situated in four spatial dimensions. They do not have to be rendered realistically: some of them use 3D+stereo, some just 3D, and some only 2D. This is not meaning the other described fourth dimension, that of time. Technically all games exist in time and would thus be 4D. 4D-TRIS is a free game. This means that the source code is available to be studied, modified, and distributed. Most projects look for help with testing, documentation, graphics, etc., as well. 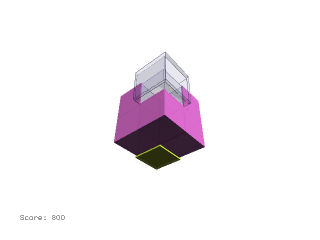 4D-TRIS is a logic game in 4 spatial dimensions, based on Tetris, written in C by Simon László. The game uses 2x2x2 levels, thus having a 8-cell bottom like most 2D Tetris games do. The source code (there is no media, shapes are drawn automatically) is licensed under the GPLv3 or any later version. A view after a first start. 4D Maze Game is a free game. This means that the source code is available to be studied, modified, and distributed. Most projects look for help with testing, documentation, graphics, etc., as well. 4D Maze Game is a game where the player navigates a 4 dimensional maze. The latest version was released in February 2008. The game has been developed by John McIntosh in the Java programming language. It has been released into the public domain, it is free software since the source code is available on the homepage. 54321 is a free game. This means that the source code is available to be studied, modified, and distributed. Most projects look for help with testing, documentation, graphics, etc., as well. 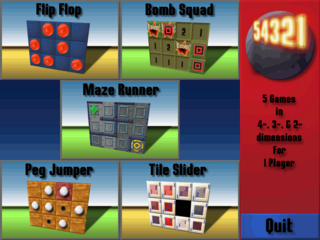 54321 is a set of four-, three- and two-dimensional (all presented as a number of 2D boards on the screen) implementations of five classic puzzle games. It is written in C++ by Patrick Fleckenstein for the 1mb SDL Game Programming Contest sponsored by Linux Journal, Loki Software, and No Starch Press. The latest downloadable version is v1.0.2001.11.16. 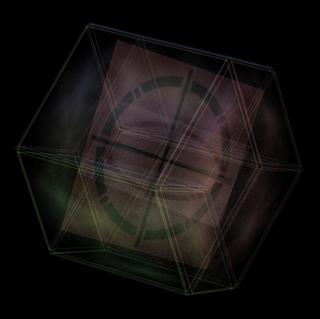 Adanaxis 1.2.5, level 4 (low detail). Note the transparency levels and colorful dot angles. Adanaxis is a free game. This means that the source code is available to be studied, modified, and distributed. Most projects look for help with testing, documentation, graphics, etc., as well. 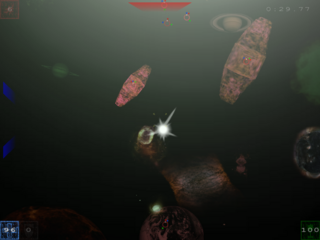 Adanaxis is a deep space first-person shooter game in four spatial dimensions, written by Andy Southgate. The latest version of the game is 1.2.5. It is written in the C++ programming language using the GLUT library. The ball in flight in the 4D mode. 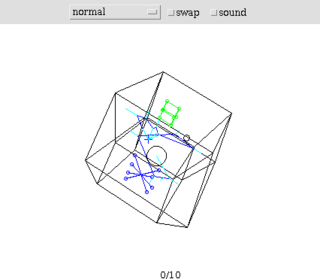 Hypercube is a free game. This means that the source code is available to be studied, modified, and distributed. Most projects look for help with testing, documentation, graphics, etc., as well. 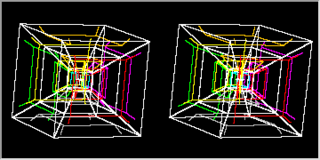 Hypercube is a golf-like puzzle game around a tesseract (4D hypercube), written in Java by Harmen van der Wal. The latest version is 1.6, released on 2008-07-28. This page was last edited on 13 March 2018, at 22:24.